Summer can take your breath away. Is there a magic plant that will stand up to heat, gardener neglect, small amounts of moisture, and then pelting rainstorms? This was a tough year in my garden. Everything looked overgrown and messy. Even my containers didn’t fill out or fill me with pride. It was Hot with a capital “H.” Heat wilts this gardener just as quickly as the plants. Air conditioning has been a boon to Southern states’ growth, but a bane to Southern gardeners like me, who have become too accustomed to cool, dehumidified air. Use to be, I could work outside for hours. Now I am spoiled. Moreover, my garden shows the neglect. 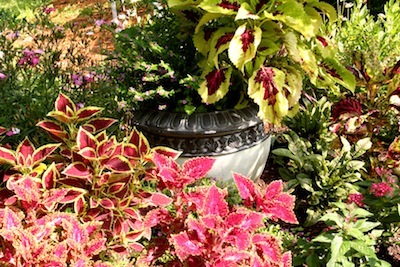 It is probably time to replace many of the perennials and annuals with easy-care shrubs that can look after themselves. I’ll think long and hard about this. A few flowers did well even with my neglectful care. One, blooming now even though I only pinched it once, is my favorite fall chrysanthemum, ‘Ryan’s Pink.’ Pink isn’t a fall color, you say? Well, neither is baby blue, but I love the combination of pink and blue in the garden. It arrives in the fall just in time to calm those reds and golds of autumn. The blue is supplied by the mistflower (wild ageratum-Eupatorium coelestinum), also known as a weed. It happily seeds itself about but is easy to pull up in unwanted areas. Is there anything tougher under the noontime sun than lantana? There is another, canna. Both of these take a minimum of care although the canna flowers look best when the forming seedpods are removed from the flower stalk. 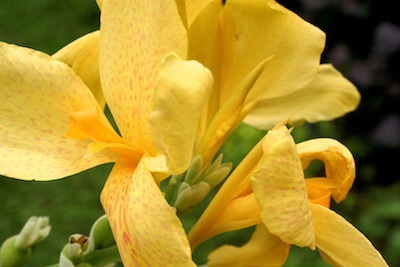 This takes just a few minutes, depending on the stand of cannas in your garden. And, stand they do, having sturdy tall stems that never have needed staking in my garden beds. Plus, they multiply quickly and are easily shared with friends. For grand looks and ease of care, my sunny bedding flowers of choice are annual vinca for summer and violas for winter. They have become the staples in my front street beds. With some slow release plant food when they go in the ground and a little water occasionally, they blossom all summer/winter long. 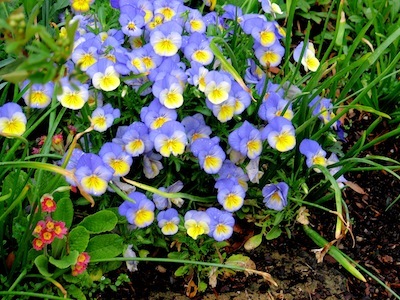 I used to use pansies in the winter beds, but I have found violas are much more forgiving of a lazy gardener. There is no deadheading or weekly feeding needed to keep them happy. 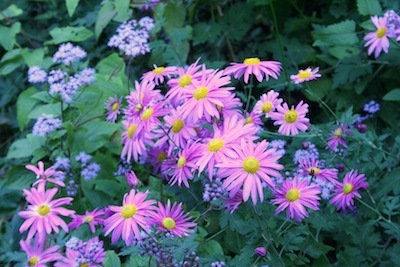 The flowers are small, but they cover the green and are quite large plants by springtime, showy enough for the passersby. They also will take some heat if we get spikes of temperatures in the spring or fall, which seems to happen more often lately. Is there anything more common than impatiens aka busy Lizzie? There is a reason for their heavy planting. They bloom in the shade until frost turns them to mush. Water them; that’s all the instruction you need to have color in the shade. Sun coleuses are the VIP’s of foliage plants. They hold up to the heat, humidity, and sizzling sunshine without a problem. They even take shade, although their colors might suffer a fadeout. They do equally well in the ground and in pots. They do require snipping now and again to keep them in shape. The pinched parts are easy to root. Remove any limp tips and stick in a pot of soil-less mix. Keep the pots watered and in the shade. In a week or two, you have free plants to fill in spots where those finicky plants you had to have - died. We need landscapes that can fend for themselves for a couple of months with just the occasional nip of a dead flower or the start-up of a sprinkler. These plants are gardener tested. They can weather the heat and storms. Save your breath. These can take the heat.